Earn up to 95 reward points. The duo that brought us The Flute Scale Book and the acclaimed Flute 101: Mastering the Basics now expand the series with Flute 102: Mastering the Basics. For students approaching the intermediate skill level, George and Louke turn to the use of etudes, solo repertoire, and orchestral excerpts to build upon the lessons of Flute 101.Underlying the method are practicing and phrasing guides, invaluable for students and continued use thereafter. 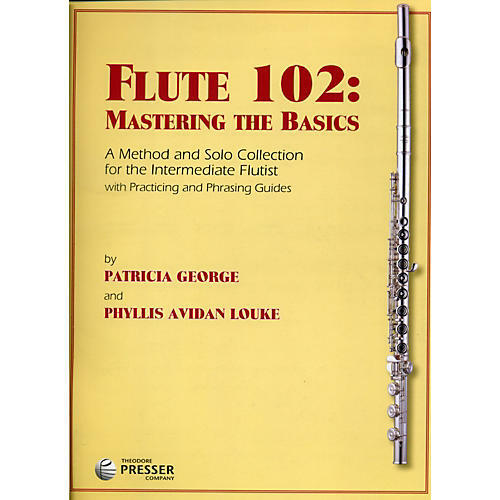 From the authors: "Each of the units of Flute 102: Mastering the Basics includes five separate lessons of exercises and repertoire in a major key, relative or parallel minor key, or dominant key. The theoretical exercises feature scales, thirds, arpeggios and major/minor seventh chords, rhythm studies and etudes by Barret, Gariboldi, George, Louke, Soussmann, and Wohlfahrt. The Contemporary Techniques Solos at the end of the book may be used with any lesson to enrich the flutist's study."